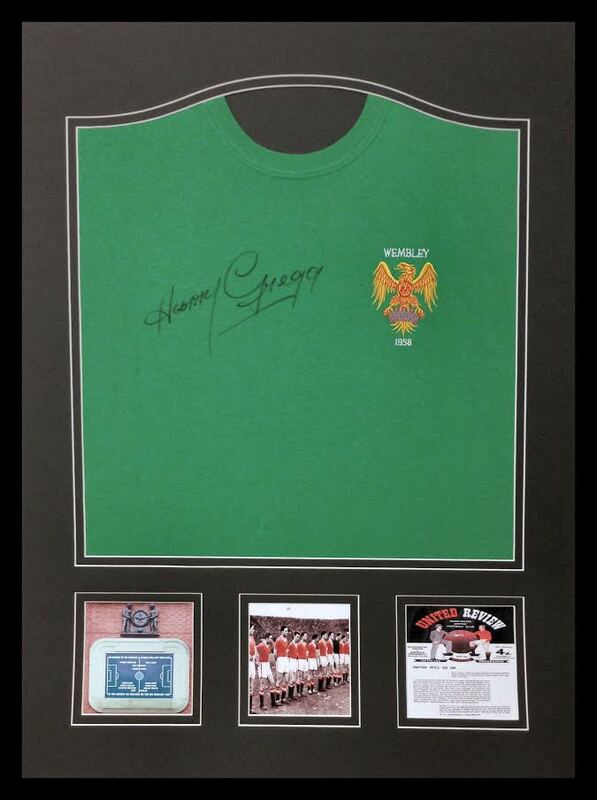 This is a charity fundraiser in co-operation with Harry Gregg to raise funds for The Harry Gregg Foundation and M.U.S.T - the Manchester United Supporters Trust (of which Harry is also a patron) with proceeds to be split between the two organisations. 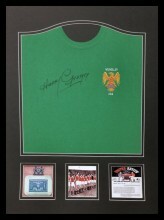 Harry has agreed to autograph 100 shirts (replicas of the 1958 FA Cup Final Goalkeeper shirt as worn by Harry himself). He has rarely done signings in the past but crucially, he says this will be the last such shirt signing he will do - ever - so these are going to be treasured collectors items from a true Manchester United legend - The Hero of Munich. 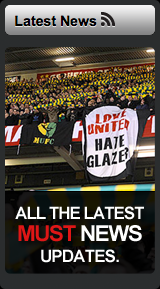 Harry needs little introduction to Manchester United supporters. Born on 27th October 1932, in Magherafelt, Northern Ireland, Harry arrived at Old Trafford bearing the tag of The World's Most Expensive Goalkeeper. Prior to leaving Ireland, he was capped at every level, schoolboy, youth, amateur and Inter-League. As we all know, Harry was a survivor of the Munich disaster, showing unbelievable bravery, going back into the flaming wreckage to carry out a 20-month-old baby and a pregnant woman before returning to save teammates Bobby Charlton, Denis Viollet and Jackie Blanchflower. He was part of the patchwork team that Jimmy Murphy built after the crash. Even after a horrific shoulder injury, when surgeons said he might never play again, he battled back to fitness, to play against Benfica seven months later. Although Harry was once again United's first choice goalkeeper, he suffered injuries in a very bad car crash, missing most of the 64/65 season, but remained in the first team until Alex Stepney was bought in 1966. 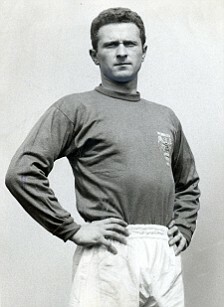 In a playing career, which spanned almost two decades, he won 25 International caps for Northern Ireland, assisting his country to the quarter finals of the World Cup in Sweden in 1958, where he was voted the tournament's best keeper. In 1995, Harry was rewarded by his country, receiving an M.B.E in the Queens Birthday Honours List, which he accepted on behalf of the many friends who perished at Munich. We are honoured that such a man accepted our invitation to become a Patron, firstly of Shareholders United and then M.U.S.T. Founded in 2015, the Harry Gregg Foundation is a local charity catering for all sections of the community; to promote positive changes, and provide opportunities to fulfil dreams. The Foundation encompasses the work previously undertaken through Coleraine FC Academy and continues to affirm all that the Academy stands for. The Foundation facilitates a wide range of activities for thousands of people each week within our local community, through participation in football, and various other health, lifestyle, educational, heritage and social inclusion activities. All profits from the sale of these shirts will be split between the Harry Gregg Foundation and the Manchester United Supporters Trust.